Bryant McIntosh drives to the hole. The freshman guard continues to stake his claim as one of the Big Ten’s best newcomers, but his 18 points and five assists Saturday against Purdue were not enough to lift the Wildcats to victory. At least it wasn’t close. 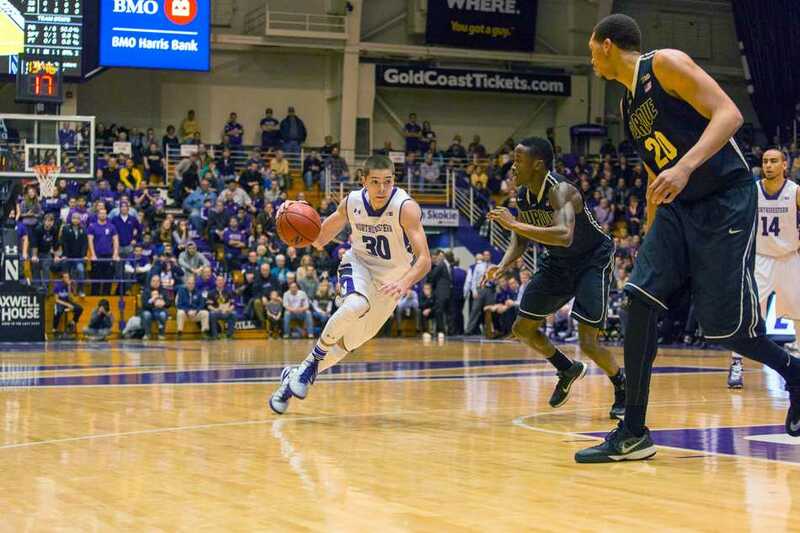 Northwestern (10-11, 1-7 Big Ten) fell 68-60 on Saturday at Welsh-Ryan Arena to conference foe Purdue (14-8, 6-3) for its seventh consecutive loss. After the last five, which ranged from close to downright heartbreaking, the defeat seems relatively mild for the Wildcats. NU struggled with foul trouble from the opening tip, with junior center Alex Olah, senior guard JerShon Cobb, senior center Jeremiah Kreisberg and sophomore forward Sanjay Lumpkin each picking up two fouls in the first half. The Boilermakers capitalized on the resulting free throws, making 9-of-14 in the opening 20 minutes, and also took advantage of a size mismatch down low against little-used freshman forward Gavin Skelly. In spite of that, the Cats actually held a slim 29-28 lead at halftime, but NU was unable to hold on to that edge. Purdue went on a 15-2 run at the beginning of the second half and never looked back, playing with a comfortable cushion for the remainder of the contest. Purdue coach Matt Painter rotated a pair of seven-foot centers, starter A.J. Hammons and backup Isaac Haas, to great effect, stifling NU’s offense and overwhelming Olah on defense. Olah finished the game with just 4 points and one rebound and fouled out with 3:15 to play in the second half. His substitutes, Kreisberg and Skelly, were hardly more effective with a combined 4 points and four rebounds. With its big men compromised, the signature move for NU on offense was a high ball screen to move Purdue’s rim protector away from the basket and isolate him against a quicker guard. It was effective, but the Cats had trouble scoring out of every other set they ran and finished the night with just nine assists. Demps paced NU with a game-high-tying 18 points but also scuttled the squad shooting percentage with a lackluster 6-of-18 night from the floor. He was the go-to option for driving the lane but too often settled for contested looks and simply couldn’t get many shots to fall. McIntosh was his usual self, furthering his claim to being the Cats’ best player. The point guard also had 18 points on a much more efficient 7-of-12 shooting to go along with five assists and two rebounds. As a team NU shot 42 percent from the floor, a number that wasn’t enough to yield victory despite the Cats attempting 10 more shots than the Boilermakers. The difference came at the free throw line, where Purdue was 24-of-32 compared to NU being just 8-of-11. “32 to 11 at the free throw line, that disparity makes it hard to win,” Collins said. NU has a short break before returning to action Tuesday on the road against Nebraska, as the Cats’ search for their second Big Ten win continues.